Couples skating in Ottawa, 1880 (via the Ottawa Citizen). 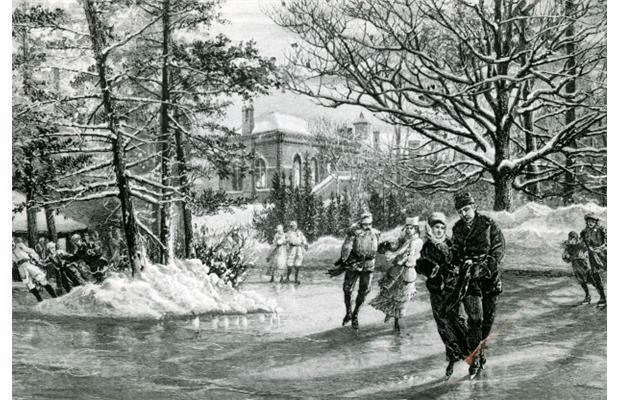 In late November of 1880, winter had taken full grip of the town of Peterborough. The newspapers reported that Lake Scugog was frozen over, with the ice seven inches thick. The roads were suffering too – the butcher’s sleigh overturned at the corner of Simcoe and George, tipping out the boy driving it. Fortunately, he was unhurt, and the horses stopped to wait for him to climb back in. But what else was going on, at home and abroad? Click on, for more trouble in Ireland, a waterway, and a quick note about winter recreation! “The approach of another session of Parliament brings this important scheme to the front again,” wrote the Peterborough Examiner on November 25th, 1880. “This important scheme,” one with major local ramifications, was the Trent-Severn Waterway. Although construction of the waterway, connecting Georgian Bay with Lake Ontario, had begun nearly a half-century earlier, it had progressed only in fits and starts, and the Examiner‘s editors, among others, wanted to see things stepped up. The commercial benefits of the waterway were self-evident; among other things, it would provide a direct, not to mention relatively short and safe, route between Chicago and Montreal, and would thus put Peterborough right in the middle of the booming shipping trade from the upper Midwest of the United States. In fact, by the Examiner‘s figures, the Trent-Severn Waterway would save Chicago shipping concerns 36 hours per one-way trip, compared to the Welland Canal route, and about $1,000,000 a year in total. 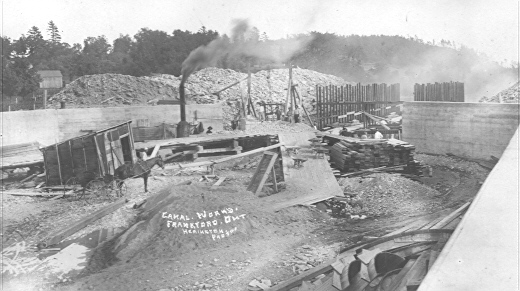 Canal works at Frankford, Ontario, on the Trent-Severn Waterway. Year unknown. (via Trent University). Sadly, it was not to be. The slow nature of the construction work lingered on. By the time the Waterway could be traveled by boat from end to end, in about 1920, railways and larger cargo ships had rendered the canal system unusable for major commercial transport. There was, of course, a local reason for the Examiner to be so hot about the construction of the railway. Under the previous, Liberal, government of Alexander MacKenzie, the construction of the transcontinental railroad had been a public venture, run by the Department of Public Works. 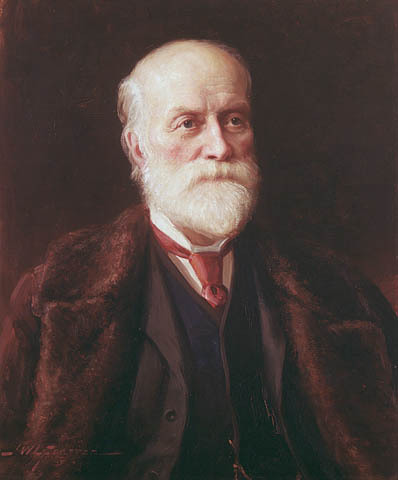 More importantly from the newspaper’s point of view, the chief engineer had been Sandford Fleming, long-time resident of Peterborough, married to a Peterborough girl, and the son-in-law of the town’s former Sheriff and Member of Parliament. With the re-election of John A. MacDonald’s Conservatives in 1878, however, the project was turned over to a consortium of the “curiously impecunious millionaires” mentioned above, and Fleming found himself out of a job. That dismissal, combined with the Examiner‘s long-standing dislike of the Conservatives on other grounds, goes far towards explaining the bitter tone adopted by the paper. Peterborough Times, November 27th, 1880. The other major bit of Canadian news in the Peterborough papers at this time was dreadful. On November 12th, an explosion had occurred in the coal mine at Stellarton, Nova Scotia, killing 50 miners, not to mention all of the horses in the mine. The Peterborough Times, on November 27th, soberly urged Peterborians to start raising funds “towards relieving the wants of the 130 orphans and widows at Stellarton.” It was not, sadly, the last mining disaster to hit the Stellarton area; 88 minors died in an explosion there in 1918, and the next-door community of Plymouth lost 46 in a similar accident in 1992. The landlord involved in that situation was Captain Charles Cunningham Boycott, and that, my friends, is where we get that particular word from! 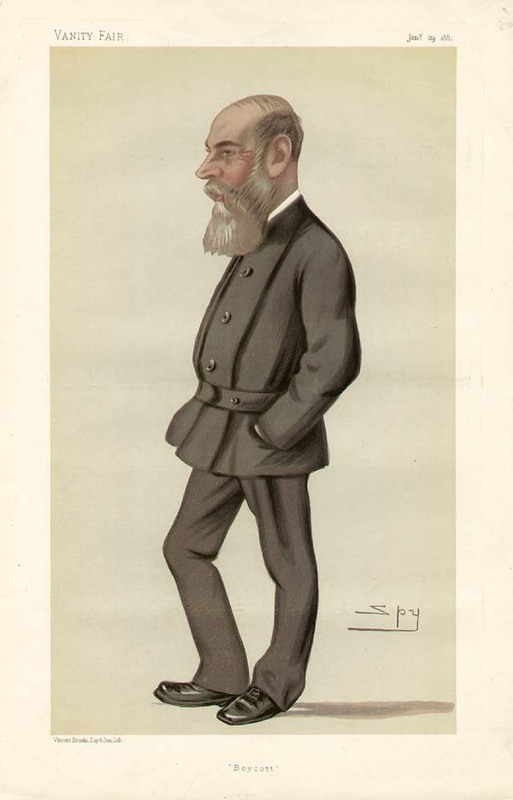 Caricature of Charles Boycott by Leslie Ward, from Vanity Fair, January 1881 (via Wikimedia Commons). Next time out, we will look at early December in 1881! *The “bay” referred to here is presumably the one formed, on the West side of George Street, by the mouth of Jackson Creek, which was then between Wolfe and Dalhousie Streets. The bay extended South from there, before swinging East and opening into the river and Little Lake roughly between Townsend and Rink Streets. Anybody need a bull? 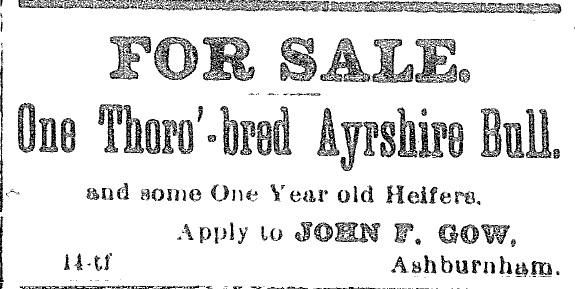 Peterborough Examiner, November 25th, 1880. This entry was posted in This Week in Peterborough. Bookmark the permalink.